Can I drive to Cordova? No. There is no road to drive into Cordova from out of town. There are plenty of opportunities to see the sights from your vehicle once here on our scenic Copper River Highway. You can bring your car on the ferry with you. Contact: Alaska Marine Highway (http://www.dot.state.ak.us/amhs/), 800-642-0066. The Alaska state ferries MV Aurora and FVF Chenega serve Cordova, Whittier and Valdez. You can also fly to Cordova year-around from Anchorage or Juneau with Alaska Airlines (www.alaskaair.com), 800-252-7522 or in the spring/summer with Ravn Airlines (flyravn.com). Where do I get hiking, backpacking, fishing, camping and cabin information? First, check out our Outdoor Recreation page (link). You can also ask: US Forest Service – Cordova District Ranger Office, PO Box 280, Cordova, AK 99574, 907-424-7661, http://www.fs.usda.gov/chugach/. Maps are available at the Forest Service office on 2nd Street and at the Chamber Visitor Center on First Street. Contact Alaska Department of Fish and Game (link: http://www.adfg.alaska.gov/index.cfm?adfg=contacts.cordova) in Cordova for this year’s hunting and fishing regulations and to get a license. (907) 424-3212, 401 Railroad Ave, Cordova, AK 99574. Are there guides available for hiking, fishing, etc? How long have you been guiding in Alaska? Are meals provided? Are snacks and water also available? Is there anytime when meals are not provided and I need to pack my own food? Is the guide certified in first aid? Does the guide carry a beacon, gun or bear spray? Is the vessel equipped with current life jackets for each passenger? A satellite phone? Does the pilot or captain have a license? Does the pilot carry a personal beacon and emergency provisions on board? Cordova rests in a temperate rainforest. Average annual precipitation is 167 inches and average annual snowfall is 80 inches. Winter temperatures average 20 degrees Fahrenheit. In the summer, temperatures can range between the 60’s and 80’s Fahrenheit. What is good to eat in Cordova? Here in Cordova, restaurants proudly serve wild caught Copper River salmon and other seafood from Alaska. Visit the Restaurants and Caterers section in our Business Directory for a full listing of great places to eat or download our Dining Guide here. The warmest and driest weather is usually in June and July, but there is fun to be had all year long. There’s Iceworm Festival in the winter, Shorebird Festival in the Spring, Salmon Jam in the summer and Fungus Festival in the fall as well as lots of other events. Check out our Events Calendar for a full list! What do Cordovans like to do for fun? In our free time, Cordovans enjoy outdoor activities like hiking, trapping, fishing, and camping. They also look forward to festivals each year, such as the Copper River Delta Shorebird Festival, our Old Time Downtown 4th of July Celebration, the Cordova Iceworm Festival, Copper River Salmon Jam, the Cordova Fungus Festival and our annual Christmas Tree Lighting & Santa Parade. In the winter Cordova is famous for her potlucks, and we have many talented amateur chefs who love to cook with wild harvested food from right here in Cordova and Prince William Sound. Cordova also has a very active art community and its local art council, Cordova Arts and Pageants brings in artists and performers all year long, mostly performing in the new North Star Theater in the Cordova Center. There’s lots more to do too. 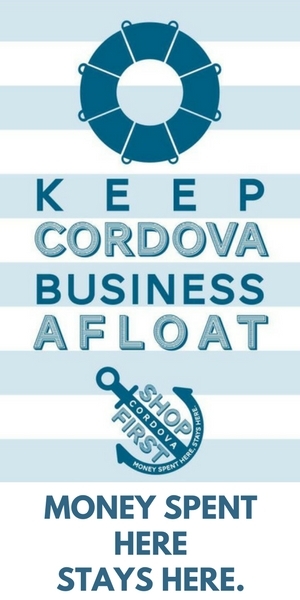 Download the 101 things to Do in Cordova brochure here. Are you within walking distance to downtown? Do you offer a shuttle? What is the room layout? How many beds, how many bath, how many rooms? Are you located near any outdoor recreation opportunities I don’t want to miss? (If applicable) Is your lodging child/pet friendly? (If applicable) Is my room and bathroom handicap accessible? How do I contact management if there is a problem with my lodging once I arrive? What amenities do you provide that I may not have heard about? Since weather in the Sound can change quickly, you will want to layer clothing even on warm and sunny days. Fleece sweaters, windbreakers, light jackets, rain gear and waterproof boots are essentials when packing for your trip. Day pack: Plan to carry a small back pack on your adventures with water, snacks like a power bar, a basic first aid kit and waterproof matches. Bear spray and a personal beacon can be small items that make a big difference. What kind of wildlife could I see? Moose, sea otters, seals, black and brown bears and birds of all kinds are common sightings. Certain times of the year you can also see spawning salmon. In certain areas of the delta you might also be able to catch a glimpse of wolves, coyotes, wolverines and other wildlife. Any tips on interacting with wildlife? Cordova is surrounded on all sides by a beautiful wilderness. Please be mindful and respectful of its spectacular wildlife by educating yourself in proper wilderness etiquette and safety. Always observe wildlife from a distance, and never attempt to feed or entice bears or other wild animals with food. Moose and bears with young can be especially aggressive. Keep your distance and never get between a mother and her young. For more info contact Alaska Department of Fish & Game in Cordova. Any other wilderness safety tips? Carrying a day pack with a basic first aid kit and bear spray or something for self defense is a good idea when hiking adventuring in Cordova’s wilderness. An extra layer or change of clothes can also be helpful as many areas can be very wet and weather can change suddenly. Check with the US Forest Service for current conditions before leaving. Before leaving your lodging, always make sure to tell someone where you are going and leave a trip plan noting the time of your departure and when you plan on returning. Even a simple flat tire can be made a whole lot easier by following these tips! Plan to take the ferry from Whittier to Cordova, which is a short, scenic drive from Anchorage or Seward. Bring your camera, your binoculars, your hiking boots, rain gear and sunglasses. Dress in layers to prepare for both sun and rain. As soon as you board the ferry, your adventure has begun with a cruise across picturesque Prince William Sound. Upon arriving to Cordova, you may want to check in to your lodging, grab a quick bite to eat and take in the view of Cordova from the water by way of the Breakwater Boardwalk in the bustling Cordova Harbor. Here you’re likely to see eagles, ravens, sea otters and fishing boats getting ready for the next fishing opener. With the long sunlit days you can easily fit a nice hike up to Mid-Way or Top Station on Ski Hill in the early morning before breakfast and afterwards visit the shops on First Street and around town. Remember to send a few postcards to friends and family back in the city! You can pick up souvenirs and handmade artisan products at nearly every local retailer; the Cordova Museum and the Native Village of Eyak’s Ilanka Cultural Center carries these products along with a beautiful array of information and exhibits highlighting local history and culture. Before you head out on a longer hike such as Heney Ridge Trail at the end of Whitshed Road or Crater Lake on Power Creek Road; be sure to pack a lunch, a water bottle and of course your camera. You’ll experience one breathtaking vista after another. With all the hiking you’ve done and spectacular views you’ve seen an evening on the patio at local eatery is likely in order! The Reluctant Fisherman, Baja Taco, The Powder House, Fork & Spoon and Homegrown all offer outdoor seating to compliment their delicious dishes. If you’ve brought your bike with you or choose to rent one in town, you still have time to take a leisurely ride out to Fleming Spit (or “Hippie Cove” as it’s called by the locals) to watch a late sunset, salmon jumping, more eagles, ravens, otters, seals and maybe even a coyote! On your last full day in Cordova, plan to head “Out the Road”. Pack a lunch and snacks and plenty of water or pick something up ready-made at the grocery store’s deli counter. Your first stop along the Copper River Highway, a designated Alaska Scenic Byway, could be the USFS viewing station at 9 mile. It’s a great introduction to the Copper River Delta situated across from a wide-open pond with resident beavers and swans and even a muskrat or two. From here you can head farther out the road to mile 14 and to Sheridan Glacier for a picnic breakfast. There are a handful of picnic tables, the trailhead for Sheridan Mountain Trail and the easement trail across The Eyak Corporation lands to Sheridan Glacier. A short 15-minute walk and you’ll find yourself on a glacial moraine. After your visit with Sheridan, your next stop on the Delta should be Alaganik Slough at 17 mile. Your commitment to the dusty gravel road can be rewarded by an afternoon in this favorite spot. You might see moose grazing on the green growth that covers the area, minks fishing in their favorite spots along the slough and wetlands covered in wild flowers in the spring. Take a leisurely walk along the boardwalk with interpretive signs that end at a magnificent vista. To wrap up your day, you can drive the remaining 20 miles of highway to the end of the road at mile 36.5 where the mighty Copper River has reclaimed the area where a bridge once allowed passage further on to the Million Dollar Bridge. The views are well worth the drive there and back with plenty of places to pull off the road to take a picture, take in the view and breathe the fresh air. You get to conclude your visit to Cordova with another cruise across Prince William Sound to see more Orca whales, more seals, more salmon jumping and more fishing families out on the water making a living. You’ve got a few ideas now on how to fill up two great days in Cordova planning for two scenic on-water ferry travel days. Give us a call or send us an email if you have any questions. We believe you’ll love Cordova, Alaska’s Hidden Treasure. Ready to start your adventure? Check out our Business Directory.